The MS2 Process Diagnostics System is an integrated tool to help identify the causes of variability, particularly of yield and quality. It is designed for ease of use. Several levels of functionality are provided, depending, for instance, whether it is to be applied to batch or continuous processes. It is a Microsoft Windows application, and requires Windows XP (service pack 2), Windows Vista or Windows 7. Manufacturing processes, particularly those related to chemicals, such as pharmaceuticals, petrochemicals, organic synthesis and so on, are highly complex. Many variables interact to impact on quality, yield, cost of operation, life of expensive process items and many other business goals. Yet performance improvement has never been more critical to success and survival. Only by understanding the complex variability of the process can this be achieved. 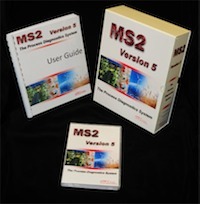 The MS2 Process Analysis System has been developed to provide powerful, advanced techniques to companies of any size; we have provided versions to sites from Small & Medium Enterprises to major refineries. Throughout 2003-5 the initial designs encompassed both batch and continuous modelling, together with some simple statistical process control functions. At the start of 2006, having recognised the potential of multivariate analysis, AJM Consulting was awarded two Research and Development grants by the European Union, which together with some industrial partner programmes enabled massive progress in functionality. Today, a wide range of advanced tools is available, including both univariate and multivariate techniques. These are integrated into a single system which has the primary features of ease of use, powerful analysis capabillity designed specifically for chemical and related processes and flexibility in both size and cost. The system is suitable for both continuous and batch production processes. Techniques such as Parallel Coordinate Visualisation and Principal Component Analysis are augmented by a wide range of data pre-screening methods which can lead to fundamental gains in process understanding being achieved rapidly. Newly released in version 5.4 (released October 2012) is Dynamic Covariance, a technique which automatically searches for correlations between variables where effects are separated by an unknown time interval (for example, comparing input and output parameters for a rotary kiln). Nor are these the only techniques available; development of more advanced algorithms, in association with the Centre for Process Analytics and Control Technology at Newcastle University, further strengthens the system's capability.